Posted on December 5, 2017 at 1:28 pm. Karamba.com is rolling out the big guns this Christmas, with an entire month of festive promotions up for grabs for real money players. 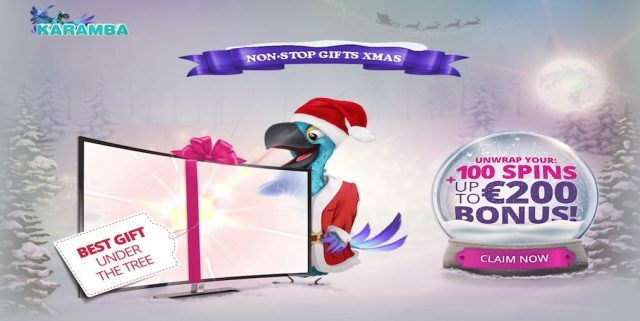 The ‘Non-Stop Gifts Xmas’ starts with a special welcome gift for new players and continues with daily and weekly prizes that include stockings full of free spins, an iPhone X and the biggest gift of all, an LG OLED TV. If you’re new to Karama, sign up this December and the casino will treat you with a special new player welcome bonus of a 100% match up to €200, along with 100 spins to use on selected slot games. To claim this bonus, you need to make a real money deposit of at least €20, and the spins will then be credited to your account over the next three days. The Xmas welcome bonus comes with a 35X wagering requirement, which must be met within 21 days of opening your account, while winnings made from free spins come with a 50X wagering requirement and unused free spins expire within 24 hours of being credited. We highly recommend you read the bonus terms and conditions at Karamba to make sure you understand your play-through requirements before making your first deposit. To get players in the festive spirit, Karamba is launching a new mission every day that can earn player’s free spins and tickets into the draw for some huge prizes. All you have to do is play the selected slot game of the day and collect certain symbols to win. Details of today’s mission can be found at the ‘Promotions’ page at Karamba.com, with eligible games and symbols changing daily. You can also check back to that page any time to see if your name is coming up on the leaderboard. The players who collect the most symbols and make it to the top of the leaderboard on the weeks ending 7 December and 14 December will each win a brand new iPhone X, with winners announced on Sunday 10th and 17th. The player who collects the most symbols and makes it to the top of the leaderboard on the week ending 21 December will win an LG OLED TV, with the winner announced on Friday 22nd. The promo expires on 25 December, so head to Karamba today and join the festivities.